Health has always been one of the foremost concerns of Prof. Lakhbir Singh, President PAHAL. Thus, to oversee his vision he took on the challenge of a medical designed especially for women and young girls with specialized doctors addressing their problems. 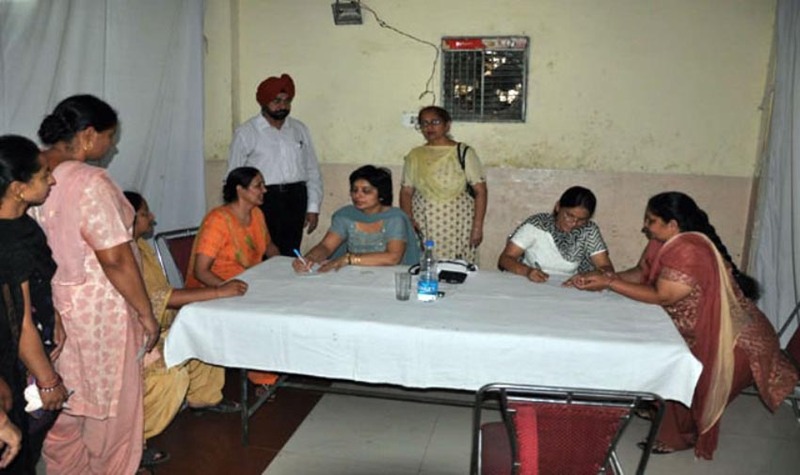 PAHAL, the Jalandhar based voluntary organisation organised a free ‘Health Check up and Medicine Supply’ camp on 30th May, 2011, in collaboration with the Punjab Armed Police (PAP) medical staff arranged specifically for the women and young girls of the PAP and nearby areas. Mr. Yashpal Singh, the head of the infrastructure and preparation team for the camp was present throughout to ensure that the camp went on smoothly and was successful in its endeavour. The camp began around 10 am on the Monday morning. A small function preceded the check up where Prof. Singh addressed all the women who had come to attend the camp. He talked about the importance of good health and how the good health of the woman of the family can mean the good health of the whole family. He acknowledged that women play a great deal of roles in their lifetime and the people around them are greatly dependent on the women for a safe and healthy lifestyle; may it be as a mother, wife, daughter, sister, etc. Thus, it is very important that women give importance to themselves, and take more care of their own self so as to work towards a healthier and holistic society as a whole. Prof. Lakhbir Singh was joined on stage by the medical staff for the day- Dr. Baljeet Kaur Ruby, Surinder Kaur, Dr. Sudha Sharma, Dr. Jyoti Sharma and Dr. Sunita Mahajan; who all spoke a few words later to show their support encouragement for the work that PAHAL was doing and the need and importance of such medical camps. Prof. Singh facilitated the doctors as a token of appreciation for their efforts and the collaboration with PAHAL for such a noble cause. Following this, the camp was inaugurated by the senior most lady, Garnam Kaur, present in the camp as a gesture to obtain blessings and wishes for the success of the camp. DSP Lakhwinder Kaur was also present as the Chief Guest to grace the occasion. As soon as the check- up began, the supporting staff was distributed as per their work. All the patients had to get themselves registered answering general questions about their health and family. This was followed by a weight and blood pressure evaluation which helped organised the patients according to their problems and the kind of help they would need. The two doctors taking the general patients were Dr. Sudha Sharma and Dr. Jyoti Sharma, the gynaecology problems were being taken by Dr. Sunita Mahajan, Head of the Gynaecology Dept at PAP Hospital and the medicines were being given out to the patients, according to their prescriptions, by Dr. Baljeet Kaur Ruby and Mrs. Surinder Kaur, the pharmacist. Dr. Raman Sharma, also from the PAP medical staff who had helped organise the camp was also present throughout to show his support and encouragement. The doctors were helped and supported by 16 young trainees from the Indian Medical Institute (IMI), Jalandhar who managed the blood pressure and weight evaluation and assisted with the distribution of medicines thus reducing the burden of the doctors.